Cars should be banned from idling near schools and congestion charges imposed across the UK. These are key measures recommended by Public Health England (PHE) to stop the 36,000 people dying each year from human-made air pollution. In a 263-page review of the options for improving air quality, PHE also pointed to emerging evidence of air pollution causing dementia, low birth weight, depression and diabetes. 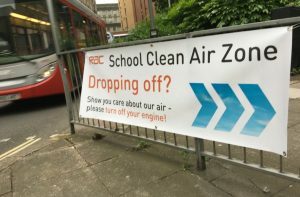 They are calling on councils to introduce no-idling zones outside schools and hospitals; the imposition of more congestion charges and low emission zones. They also urge the development of a vehicle-charging infrastructure to promote a “step-change” in the uptake of electric cars. The review stops short of suggesting banning cars from the school run. However, there is a strong political consensus about the need right now to stop idling outside schools to curb air pollution. A very recent peer reviewed study by scientists at the University of Basel Children’s Hospital found that increased air pollution levels from birth were associated with reduced lung function at six years. In the cohort, 52 children that were exposed to NO2 levels from the highest quartile during pregnancy, had a significant decrease in Forced Expiratory Volume (FEV1) in the first and second years of life and from birth. The results suggest that exposure to higher NO2 levels, especially during the sensitive period of early lung development, may be associated with reduced lung function at school-age. Children can breathe in up to three times more air relative to their weight. This means they take in a greater volume of air pollution, which can stunt lung growth and increase their risk of respiratory disease. The RAC says idling engines produce levels of CO2, NO2 and PM2.5 over two times as many as those in motion. Most instances come from ‘avoidable’ road situations such as waiting to pick someone up outside a workplace or school. They quote research showing that 23% of all car journeys are two miles or under. The motoring organisation has run an awareness campaign with schools to consider whether parents really need to drive. Cutting out just a few of these types of car journeys would make a real difference. Eastbourne Borough Council is one of the latest Local Authority to launch an anti-idling campaign. Schools across Eastbourne are being invited to sign up to the campaign. 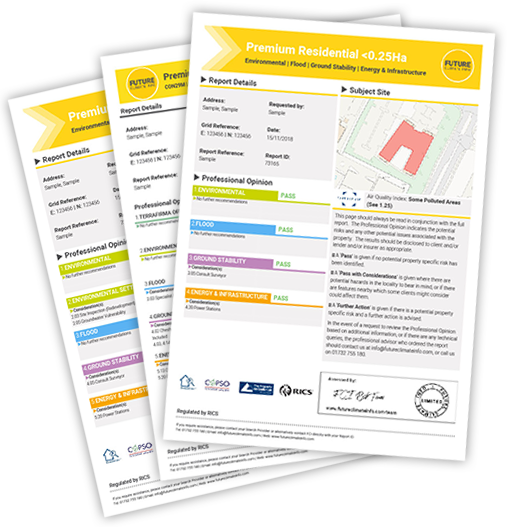 Those that do will receive digital information packs to send out to parents and pupils giving them the opportunity to find out more about air pollution and ways to reduce it. 28 ‘innovative’ Local Authority projects have also been announced that will share £3m in the latest round of funding from the Government’s Air Quality Grant. This year funding has also been awarded to trial new technology to test the effectiveness of low-cost sensors to better understand the air pollution data they produce. 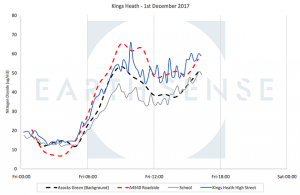 The positive impact on air quality of reducing school run traffic was clearly demonstrated on the BBC’s recent Fighting for Air programme. Again in Birmingham at Kings Heath, EarthSense were asked to design and implement the air pollution monitoring system. They deployed their Zephyr sensors, with measures taken for 3 days before and then on the day when parents were asked to bring their children to school on foot. 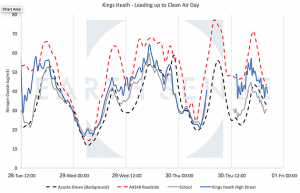 Kings Heath- Air quality readings on days ahead of Clean Air day and on the day itself – courtesy of EarthSense. Technologies are now available such as real time air quality monitoring triggering bans on specific vehicles on certain days or penalising them through low emission zone fines, such as London’s ULEZ coming in this month. Over time, the transition to greener transport and mass adoption of electric or autonomous vehicles will have the greatest societal impact. Could you be affected by Air Pollution?